Ensure you’ll have enough assets to support your lifestyle during retirement. A Fixed Index Annuity (FIA) may be a solution to retirement income needs. A number of fixed index annuity products now offer lifetime income withdrawal benefits that are either available either at an additional cost, or built in with no additional fees. However, though all can provide lifetime income withdrawals, the amount of value you receive can very substantially depending on the FIA. It’s important to understand this when deciding which income solution is a good choice for you. We have FIA solutions that can guarantee a set amount of guaranteed lifetime income and provide the opportunity for increasing income to help offset the effects of inflation. With many of our FIA lifetime income withdrawal benefits, you can have an option that guarantees income increases following every year the contract earns interest.1 And you can receive these potential annual increases in your lifetime income withdrawals despite any decline in the contract’s remaining value. (The trade-off for this increasing income opportunity is a starting income withdrawal that is lower than the predictable payment option). In considering the value of increasing income, you should also take into account how inflation – a rise in the price and goods and services – can reduce your purchasing power. 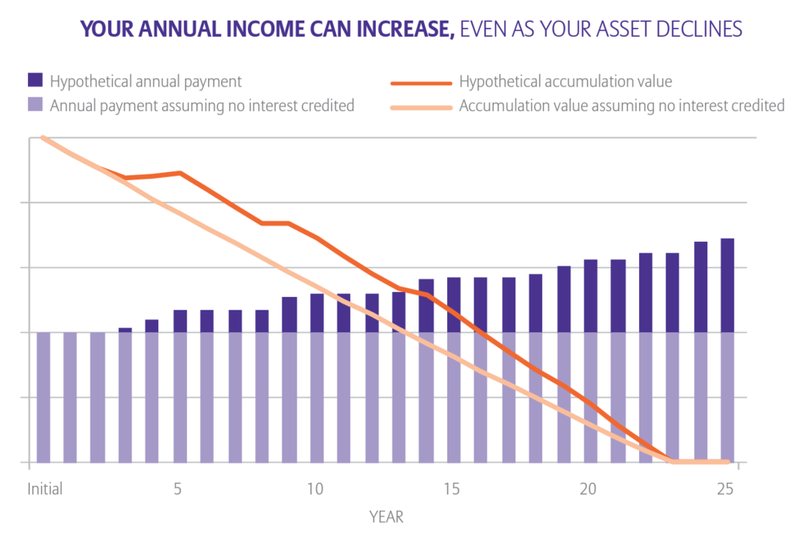 If your overall income doesn’t change, it will buy you less and less over time as inflation increases. Using actual Consumer Price Index (CPI-U) inflation figures, we see that even though your fixed payment remained the same, by the 25th year, that income payment’s purchasing power was actually 43% less than when your payments began. As you prepare for retirement, rethink simply looking for guaranteed retirement income – look for increasing income potential. Are you wondering whether you’ll have enough assets to support your lifestyle through retirement? Click the button to learn more about how to protect your retirement assets.